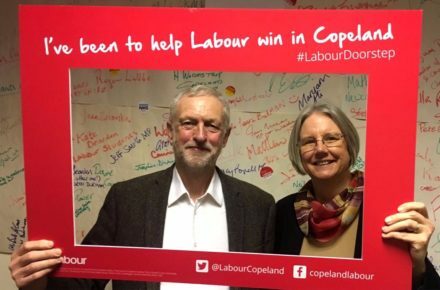 We are all devastated by the result in Copeland, for the people of West Cumbria, Labour’s candidate Gillian Troughton and the hundreds of activists who campaigned ahead of the by-election. As a party, and as a movement, we clearly must do better. In the days since the vote, the airwaves are filled with criticisms of the Labour leadership. Labour’s defeat in Copeland demands a period of serious reflection but calls for Jeremy Corbyn to resign are misguided. After losing two general elections back to back, the task of winning back the trust of voters was always going to be difficult. Labour’s decline long pre-dates Corbyn’s leadership. To deny that would be disingenuous. The desire for a clean break from Tory-lite austerity politics was exactly why Jeremy Corbyn was twice elected Labour leader with an overwhelming mandate from members. Labour members were fed up with the tradition of neglect of communities like Copeland and Stoke and desperate for a real alternative to the Tories. Under Corbyn’s leadership, this is what Labour is beginning to offer – a manifesto based around investing in forgotten communities and ending the dominance of Westminster elites. Areas like Stoke and Copeland have been neglected by political establishment for far too long. It may seem counterintuitive that this resulted in Conservative gain, but Labour has been haemorrhaging votes in election after election in Copeland since 1997. The centrality of the nuclear industry to the by-election shows the extent to which communities like Copeland have been forgotten by Westminster. Decades of under-investment, at the hands of both the Conservatives and New Labour, has resulted in one major employer in the area, so while people in Copeland fear the Tories’ attempts to downgrade the A&E department and maternity services in their hospital, fear for jobs was always going to win out. We must also take note of the desperate need for a drastic overhaul of the Labour Party machine. The policies put forward by Jeremy Corbyn, such as national and regional investment banks to invest in infrastructure and public services, are common sense policies for the majority of the population. We have to take advantage of Labour’s mass membership of over 500,000 people, the majority of whom joined Labour because of Jeremy Corbyn, to win back the trust of voters and root the Labour party in communities so we can effectively communicate Labour’s plan to rebuild and transform Britain. We must explore new ways of getting out our message. Momentum has been developing innovative campaign techniques help mobilise Labour members to campaign and make politics more accessible. Through our newly developed Momentum Carpool website, 85 carloads of Momentum activists were organised to travel across the country to campaign, with many more cars organised through our local groups. Mobilising digitally helped to get hundreds of activists out in Stoke and Copeland over the past three weeks. Momentum has 20,000 members, the potential of an army of activists that Labour could deploy if they used similar campaigning techniques is overwhelming. This also requires a fundamental re-think of our approach to politics. Rather than swooping in to sell Labour’s message just before an election, we need to be supporting and empowering people to organise locally from the ground-up, with policies and campaigns coming from communities themselves rather than these being introduced from the top-down. We have an opportunity now to transform Labour into a truly grassroots, democratic party. This is how we will counter the rise of the far-right, and build a movement that meet the challenge of replacing a failed neo-liberal economic model and re-balancing structures of power and wealth in our society. In mourning the result in Copeland, we must not ignore the significance of crushing UKIP in Stoke Central. Despite political commentators spending months playing up UKIP’s threat to Labour in our heartlands, the people of Stoke resoundingly rejected the politics of hate and division and returned a Labour MP to parliament. Nuttall has attempted to spin the result by claiming Stoke Central was only number 72 in the list of UKIP’s target seats, but in reality if UKIP’s leader cannot win in the Brexit capital of Britain (where they came second in 2015), they have been buried as a political force. Labour needs to win. But we won’t do so if we return to the business as usual approach of doing politics that has seen us lose millions of votes and crushed in the general elections of 2010 and 2015. We must press on and continue to build a Labour Party that stands up for ordinary people, rejecting austerity and putting forward a plan to invest in forgotten communities. Together we can, and we must, offer the hope of a real alternative for the millions of people who have been let down by the political establishment and want to be part of building a better Britain. Emma Rees is a national organiser at Momentum.